In India, All Religions Join In 'The Big Day' Christians the world over are celebrating Christmas. India, the birthplace of Hinduism, Buddhism and Sikhism, marks the birth of Jesus with a national holiday. In this land of great religions, Christians and non-Christians join in the festivities of this season with song and special meals. 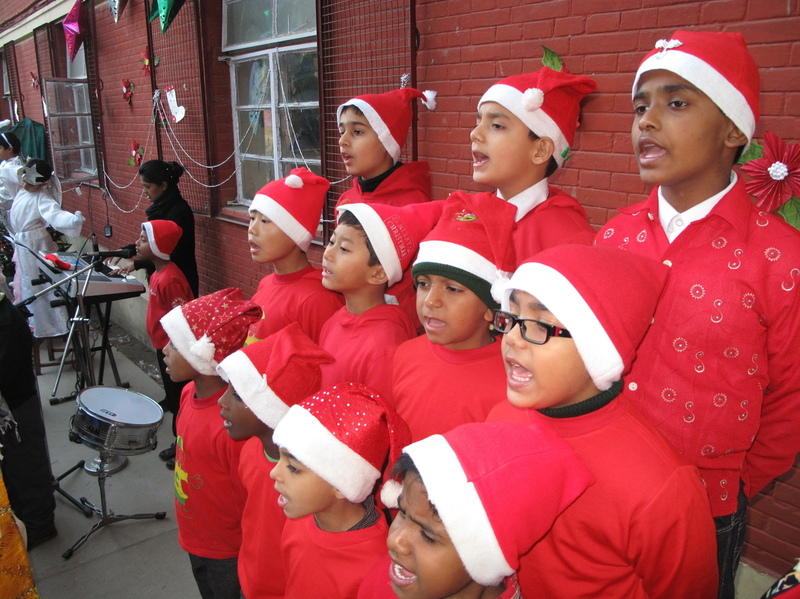 Carolers from St. Columba's School in New Delhi stage their annual Christmas program, where the student body is Catholic, Sikh and Hindu. India, the birthplace of Hinduism, Buddhism and Sikhism, marks the birth of Jesus with a national holiday. Indians call Christmas bara din, or the Big Day. Chef Bhakshish Dean, a Punjabi Christian, traces the roots of Christianity in India through food. Standing in the New Delhi kitchen of one of several restaurants he overseas, pots bubbling with scrumptious holiday specials, Dean says Syrian Christians were the first to arrive in India, in the first century. The ancient sect devoted to St. Thomas the Apostle is believed to have first landed on the Indian coast in what is today the state of Kerala. He says they came with the fabled spice trade, intermarried and introduced their cuisine. Dean's Syrian stews, which top his Christmas menu, are infused with the scents of South Indian cloves, cardamom and star anise — a star-shaped spice with a hint of licorice that is popular in cooking throughout South Asia. 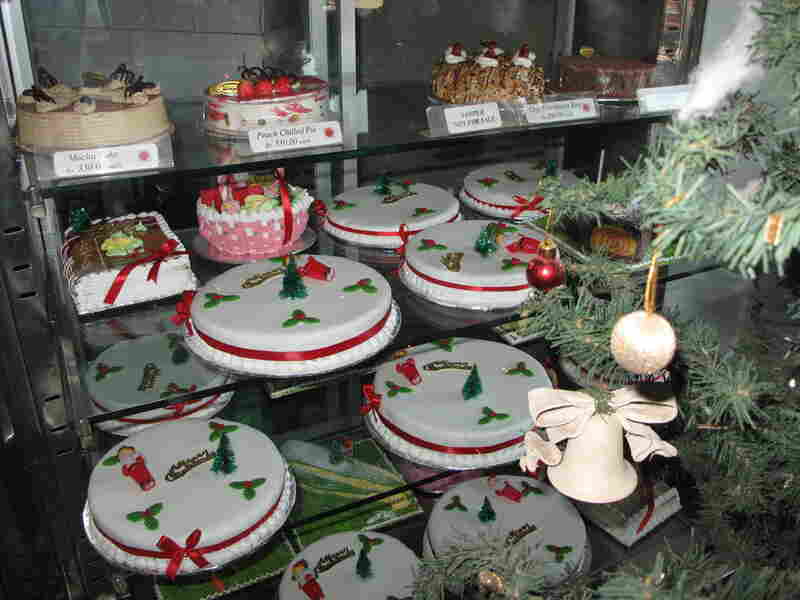 Christmas cakes filled the window at Wenger's, the fabled 86-year-old bakery in Delhi. Just 2 percent of the Indian population is Christian, but writer Naresh Fernandes says, "That's 2 percent of the population of one billion. So that is quite a lot of people for whom December 25th is very important." Fernandes says in his Roman Catholic neighborhood in Mumbai, the Portuguese converted the locals and Christmas tends to be "big opulent meals" that start in the afternoon and go late into the night. "Things like vindaloo, which is a preparation made of pork," he says, adding, "no roast turkeys, but lots of things involving fat and pig-lings." The British Raj also may have fixed Christmas in the Indian imagination as quintessentially English: the requisite roasted turkey and tipple of mulled wine. They'll grace many Yuletide tables of Delhi's sizable expatriate community. Delhi-based food writer Pamela Timms says she's managed to Indian-nize her traditional recipe for mince pies, which includes "glacee cherries." "I found out this year they are not actually cherries in India," she says. "They are made from a local berry called karonda, which is pink and white in its natural state but once you add sugar to it and boil it away, it looks like a glacee cherry." As a long-time resident of India, Timms says Christmas seems to slot right into the pantheon of festivals in the Indian calendar. "It's a time of year that comes right after lots of other Indian festivals, so the country is already in festival mode," she says. Carolers from St. Columba's School in the capital stage their annual Christmas program that expresses the multifaith nature of India. This alma mater of health guru Deepak Chopra was founded by the Christian Brothers of Ireland, and while it is a Catholic school, the student body is also Sikh and Hindu. 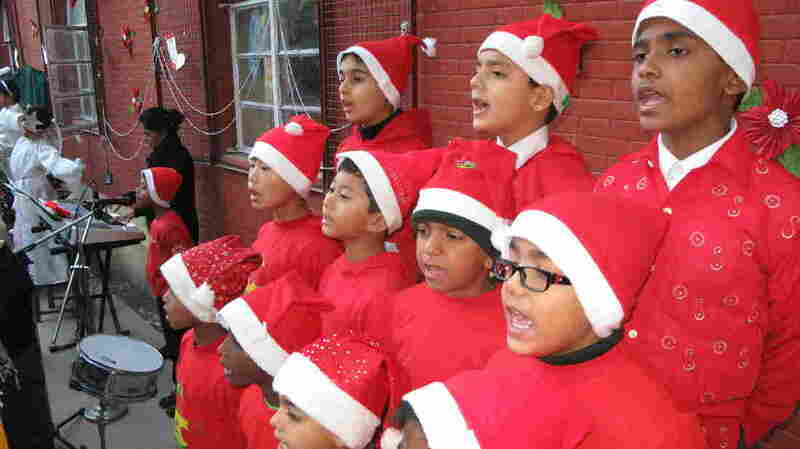 Arsh Wahi, a Hindu student at St. Columba's, says his family puts up a Christmas tree every year and stocks up on plum pudding and other Christmas goodies from the fabled Dehli bakery called Wenger's. With its 70 varieties of cakes in the shape of stars, yule logs and Santas, this 86-year-old establishment is jammed this time of year with holiday-makers who eat and sing their way through the season. Choirs echo in the churches across the city, and choral groups perform Christmas concerts. Neeraj Devraj, a soloist with The Capital City Minstrels, says he's not Christian or religious, but celebrates Christmas with the same fervor he celebrates the Hindu festival of lights known as Diwali, and the Muslim feast of Eid. "For me personally, Christmas is about getting together with the people you are fond of, people you love," he says. "It's great fun, it's the joy of giving. It's very Indian ... to just celebrate the aspect of being alive and being around people who matter."